The Gaylor Group, LLC owns the rights to the Best in Business Award brand name and program. John Gaylor has over 30 years of marketing, advertising and public relations experience and has served in senior level positions for both Fortune 500 and Fortune 100 companies during his tenure in the corporate world. From the beginning, Gaylor has been actively involved with the development and implementation of the Best in Business Award Program and has helped launch this annual campaign in three states over the last twelve years. Profiles offer a quick guide to the Best in Business Award recipients. We are currently seeking nominations and would appreciate your input as a consumer. 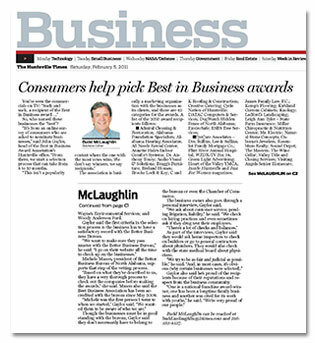 Read about the Best in Business Award Program in The Huntsville Times.